In the Book of Genesis God says not to eat from the Tree of Life, yet in Revelation He invites us to eat from the Tree of Life. 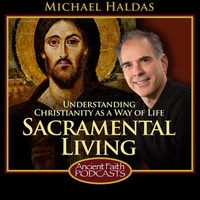 Michael explores the reasons why from an Orthodox Christian perspective. He discusses the sinfulness and sacredness of eating and hunger as taught to us through the Scriptures, specifically Genesis and Revelation, and our Holy Tradition; and what we are really doing when we fast and prepare for and receive the Eucharist.